Dolly Parton in the Movies! 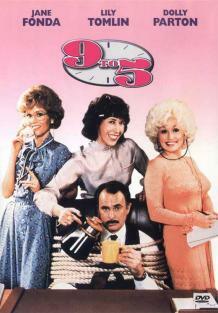 “Nine to Five is a good-hearted comedy that will win a place in film history, partially because it contains the movie debut of Dolly Parton. “Parton contains so much energy, so much life and unstudied natural exuberance that watching her do anything in this movie is a pleasure. “The movie exists in the tradition of 1940s screwball comedies. It's about improbable events happening to people who are comic caricatures of their types, and, like those '40s movies, It also has a dash of social commentary. “The message in this case has, to do with women's liberation and, specifically, with the role of women in large corporate offices. Jane Fonda, Lily Tomlin and Dolly Parton all work in the same office. “The villain is the boss himself. Played by Dabney Coleman (of "Mary Hartman, Mary Hartman"), he's a self-righteous prig with a great and sincere lust for Dolly Parton. She's having none of it.